How Would You Respond To…? In addition to this Course Catalog, Fulton Communications also provides Communications Issues Consulting and Strategic Planning. This 1 to 3-day* “hands on” course includes instruction on how to communicate with the public about environmental, health, safety and fairness issues or any other issues that create trust and concern barriers. The course is also applicable to internal organizational issues involving employee trust and concern. The course includes exercises as well as films. *The course can also include all or parts of the next 8 courses listed. In this case, 2 1/2 to 5-day courses are available. This course includes how to effectively write to various public stakeholders. The course also includes an exercise of the actual writing of documents to the public. The documents selected for the course exercise will be based on the specific type of the participants’ public assignments. This half-day to 1-day course provides skill building and actual development of key messages to be delivered verbally or in writing to the public or the media. It also includes development of more detailed information such as fact sheets. 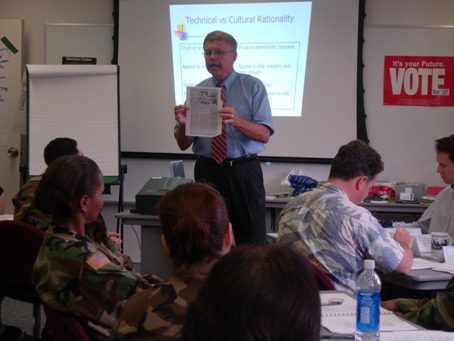 This half-day to 1-day course provides skill building or working across the cultural differences in the field of Risk Communications. This 1 to 2-day course includes discussions and small exercises followed by “hands on” practice using taped mock interviews then critiques. The interviews are based on situations that did or could happen in the participants’ interactions with the media. The 2-day course can include multi-interviews if the number of participants is small. This course provides skill building for conducting public meetings in low trust/high concern environments. 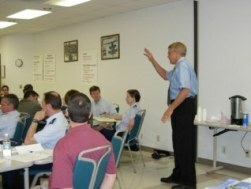 Course participants will develop tools and techniques for planning and conducting public meetings under any circumstances, e.g., hostile audiences, large audiences, audiences with active third parties, etc. This 1 to 2-hour course demonstrates how to improve listening capability through active listening. Demonstration that listening is more than words, its specific word emphasis, tone, emotional content, paraphrasing, key phrases, sudden changes and many others. With improved listening, you can quickly get to the points that matter in a difficult conversation. This course provides a community outreach strategy with nine community outreach components including how to develop these components. Also, the course reviews how to build on your existing community outreach activities. How to establish goals for community outreach. Goals are the desired end results. This 1 to 3-day course covers dealing with group differences in the workplace that may be hindering progress. The course is tailored to any group difference that is negatively impacting an organization. These could include age, hierarchy, race, ethnicity, gender style, competing organizational functions and others. This 1 to 2-day course provides skills development for employees who encounter and must directly deal with upset customers or upset employees on a variety of issues. The course will include input and group discussion of specific methods for handling these difficult situations. Then there will be classroom role-playing of some of these upset customer situations followed by a critique of how the situation was handled. The course will be interactive. In addition to the “hands on” practice noted above, there will be group discussions, twosome activities, and short exercise demonstrating some of the principles of non-verbal communication and active listening.